Based on a proprietary light engine, our solar simulation equipment delivers perfect and continuous artificial sunlight 24/7, allowing for accurate stability and performance assessments of solar cells at laboratory and industrial scales. Developing and manufacturing photovoltaic solar cells implies no compromise on testing equipment. Developers need an accurate way of measuring the performance of their prototypes and compare their experiments, while manufacturers must be able to rely on robust equipment that presents minimum operation and maintenance costs. Most light sources have severe drawbacks when it comes to solar simulation: unmatched spectrum, poor yield, small surface, non-continuous illumination, and above all, aging. How can you know a solar cell is stable when the light source used for simulating sunlight is not stable either? Is the solar cell aging, or is the solar cell observing the aging of the lamp? Fortunately, this problem is now solved. 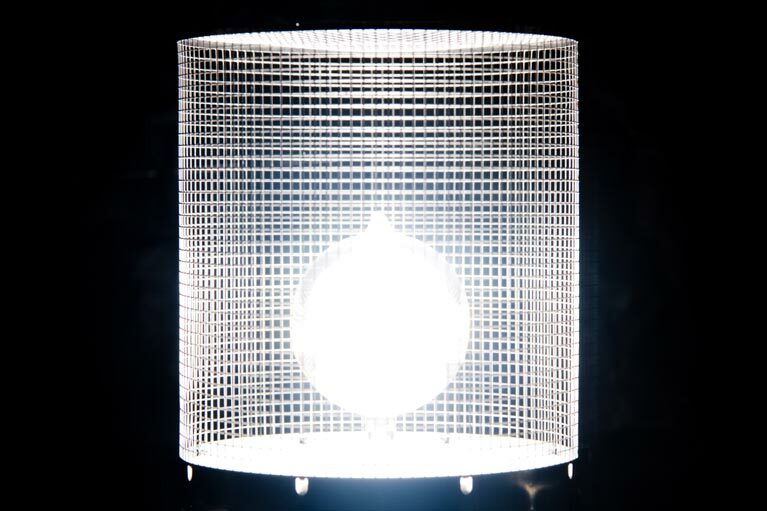 Solaronix has developed a specific kind of light source that perfectly mimics sunlight, and presents an outstanding long term light stability. 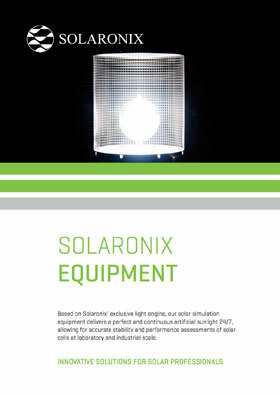 The unmatched features of the Lumixo light engine allow Solaronix to supply the photovoltaic industry with accurate and dependable testing equipment. Our competences comprise optical calculations, mechanical design, machinery assembly, electronic circuits and software development. These strengths enable Solaronix to provide turn-key equipment meeting customers' most demanding requirements, as well as consultation in photovoltaic testing. reduced cost of ownership and streamlined maintenance. 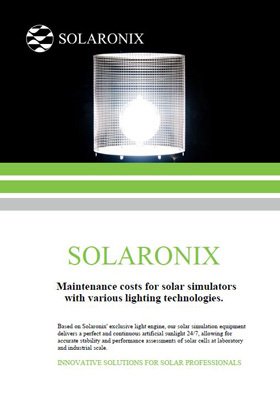 The Solixon solar simulators generate a true sun-like illumination, up to Class A+ rating over large areas. This unmatched behavior enables accurate solar simulation independent of the type of photovoltaic technology. It is very well suited for the characterization of current and future solar cells absorbing over a broad range of wavelengths, such as tandem cells, multi-junctions cells, or organic and hybrid solar cells. The Sunirad light soakers feature the Lumixo light engine matched to the type of solar cells under test. The product range comprises Class A+AA, Class AAA, Class ABA and Class ABB machines for the budget minded customers. The spectral emission of the Class A unit is specifically suited for light soaking of amorphous silicon solar cells (a-Si) and standard Dye Solar Cells (DSC). The Class A+ and Class A units are suited for the light soaking of crystalline silicon solar cells, and for the aging of compound semiconductor based thin film solar cells or multi junctions solar cells. The light soaking machines are built to be run continuously, allowing for long term tests lasting several months. Our engineering team is able to provide standard and customer specific equipment to a variety of clients, from university labs to industrial manufacturers and to certification centers. Both types of equipment can be tailor made to the required dimensions, thanks to the modular light array design of our solar simulators. We have already successfully installed custom machines with illumination areas up to 7.5 m2.